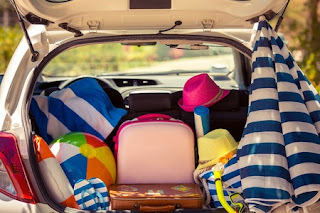 Melloy Dodge: Prepare Your Vehicle for Your Roadtrip! Prepare Your Vehicle for Your Roadtrip! As the weather warms up, many of us crave a spring or summer getaway. In addition to getting time off work, mapping your route and reserving lodging, it’s important to make sure your vehicle is ready to make the trip! At Melloy Dodge, our service department sees all kinds of damage and performs extensive maintenance, so we know how to prepare a vehicle for a road trip. No matter what vehicle you drive, whether it’s a family friendly Dodge Durango or a dependable RAM 1500, performing basic maintenance before you embark on any adventure is vital. Check wipers and fluid levels, and make sure to change your oil or schedule any needed tune ups. Check your tire pressure, and take a look at your belts, brakes, filters, and gauges too! If you’re in a truck and you’re towing a trailer, be sure to check your vehicle’s towing capacity before packing. In order to make the most of your upcoming road trip, Melloy Dodge also suggests that you map out your route before heading out, and be sure to take a smart phone with navigation or a GPS. It’s also a good idea to be prepared for anything - have a first aid kit, phone chargers, water, and snacks on board. If you have little ones, be sure to pack games, music, toys, coloring books, and or videos to keep them entertained. If you’re planning a road trip and you think it’s time for maintenance, come to Melloy Dodge. The Melloy Dodge service center has convenient hours to accommodate any busy schedule, so it’s easy to make an appointment for maintenance! We’re also proud to have one of Mopar’s Top 27 Techs on our team. The staff on our service department team is highly trained to give you the best service so when you set out on your next adventure, you know your vehicle is ready!